Toss a few hard shell clams in a pot with some wine and garlic and you’ve got dinner. Dress it up with hot sausage, white beans and a chunk of bread and you have a meal. 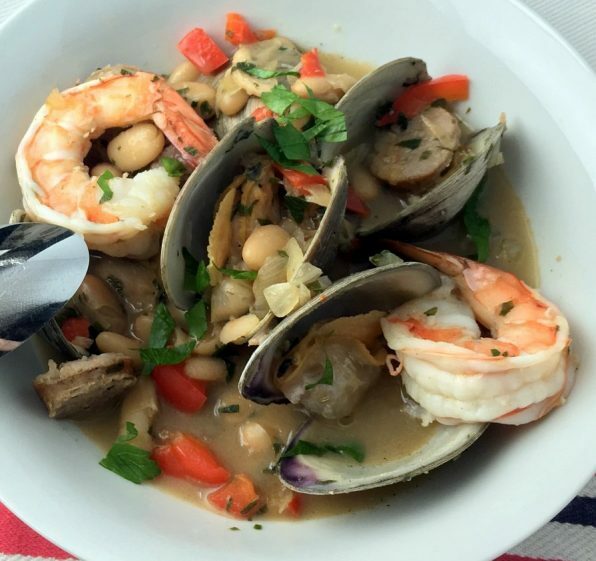 We make this Clam, Shrimp and Sausage Stew with White Beans after a trip to the fish market where we buy small hard-shell clams, which are the sweetest and easy to eat in one bite. You’ll find the widest range of hard shell clams at a large fish market. (City Fish in Wethersfield, CT is one such market.) Another local favorite I like to use in this dish is the spiced fennel garlic sausage from Orsini’s. (I preferred the sausage when Dave Orsini made it in his shop on Main Street in Old Saybrook, CT but this is still a reliable choice.) A good hot Portuguese chourico such as Gaspar’s makes a delicious stew too. Or you can change the flavor profile entirely by using Chinese sausage. Use a wide deep frying pan to cook this dish. This allows the wine and clam juice to simmer vigorously while the sauce reduces. The flavor intensifies and thickens slightly. Parsley plays up Mediterranean flavors in this dish but cilantro would be just as welcome. Atlantic hard shell clams or quahogs come by a number of names, all marketing terms for different sizes of the species Mercenaria mercenaria. Count necks, are the smallest and measure about 1 inch across the top by the hinge and they are our favorite for this dish. It’s the same clam I like for spaghetti with clam sauce or clam pizza. For comparison, littlenecks measure about 1 ½ inches; top necks measure about 2 inches; cherrystones measure about 2 ½ to 3 inches and chowders or quahogs measure about 3 or more inches. Heat the oil in a 10 to 12-inch wide and deep frying pan over medium heat. Add the sausage. Prick them in several places with the tip of a knife. Cook the sausages until well browned and cooked through. (I cover the pan with a splatter screen.) Reduce the heat half way through cooking to keep the sausages from burning. Remove the sausages from the pan and set aside on paper towels to drain off any excess fat. Remove all but 1 teaspoon of the oil from the pan. Add the chopped red pepper, onion and garlic. Cook over medium heat for a few minutes. To speed up cooking add 1/3 cup of water to the pan. Turn the heat up to medium-high and cook until the water evaporates. This softens the vegetables without the need for adding more oil to the pan. Continue cooking on medium until the vegetables soften, for about 6 more minutes. Add the wine to the onion and pepper mixture. 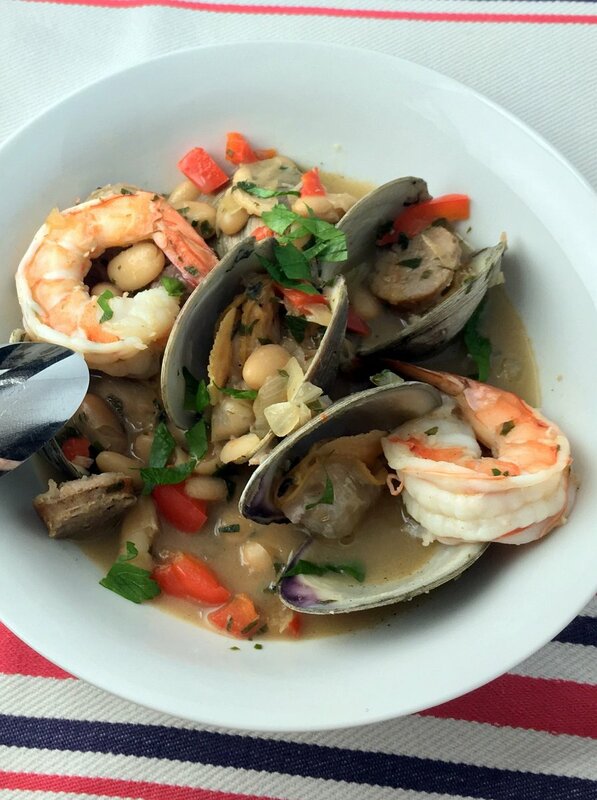 Cut the sausage into chunks and add it along with the clams. Cover the pot. Bring the mixture to a boil then reduce to a strong simmer and cook for about 5 to 7 minutes until the clams just begin to open. Add the shrimp, white beans and parsley. Cook for about 3 to 4 minutes longer until the shrimp are cooked yet tender and the white beans are heated through. Season with hot pepper sauce to taste. Serve in warmed bowls with crusty bread. Atlantic hard shell clams or quahogs come by a number of names, all market terms for different sizes of the species Mercenaria mercenaria. Count necks, the smallest, measure about 1 inch across the top by the hinge and they are our favorite for this dish. (For comparison, littlenecks measure about 1 ½ inches; top necks measure about 2 inches; cherrystones measure about 2 ½ to 3 inches and chowders or quahogs measure about 3 or more inches.) It’s the same clam I like for spaghetti with clam sauce or clam pizza.